[Feature] Getting Solid with Solid Jack (a Fitness Boxing Blog) – Entry #2: Boom. Boom. Boom. Boom! If you’re reading this, it can only mean one thing, another Tuesday has rolled around and I have managed to survive my first week of going hands-on with Fitness Boxing! Seven days ago, if you had told me I would invest ten hours into the game, I wouldn’t have believed you and yet, it’s one week later and ten hours is how much time I have put into Fitness Boxing. Despite multiple months of not working out at all, on two separate occasions I was able to stand my ground and do a full two hours before calling it quits and on one of those days, I did three hours. Although if I’m honest, on the Sunday when I did the three hour stint, it was because I had one of those rare days off and I really, really wanted to go from a total of 10,000+ punches to 15,000+ punches, just to unlock more costumes for my instructors. So, just how did the last seven days go? Well, my chosen approach was four days on and three days off and not consecutively either. Essentially, Tuesday, Thursday, Friday and Sunday were my On days and Wednesday, Saturday and Monday were my Off days. As for my chosen workouts for when the On days rolled around, honestly, I just made it up as I went. By this I mean, I had no regime I abided by, I just did want I wanted, when I wanted, as one of the worst things you can do is the same exercise over and over. Because of that, my workouts would go from a 40 minute long session focused on my chest, to a 10 minute full body session, followed by a session that just had me working out to songs for specific combo exercises in a bid to earn more Stars. In light of that spotty behaviour though, while I was able to get all three Stars on each combo exercise on the Low intensity and unlocked all 20 of the game’s songs, but despite everything I put into the game, I did have a moment where I was completely taken back. This morning, for the first time in a week, I weighed myself and the results were what I expected it to be, nothing. I would have loved to have lost something, even an ounce would have been enough of a reward, but I weighed exactly the same as I was seven days ago and at that moment, I felt greatly disappointed, discouraged and a little pissed off. Time and time again, when I have tried ways to lose weight, even taking up paddle building to strengthen my core and be out on the water, in recent years, I’d find myself putting some weight on and after a few more tries to no avail, I’d give up and tried something else. Not this time though. This time, I was prepared. This time I had told myself I would use that frustration and put it to good use, much like I did when I was less than five years ago, only this time, I wouldn’t take it out on a bag. 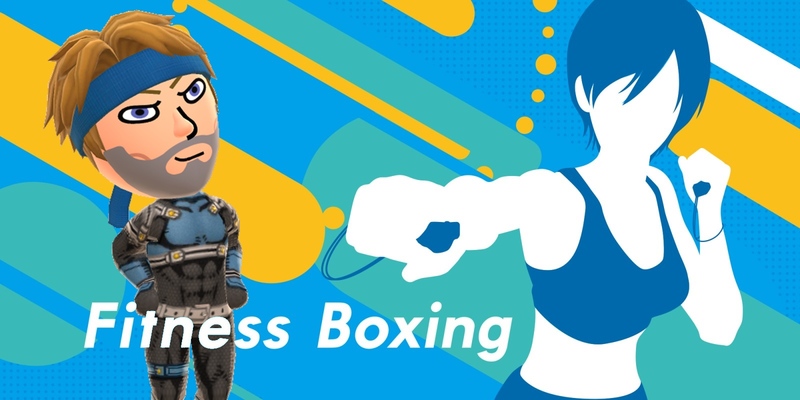 Instead, I booted up the Fitness Boxing and I embarked on a 2 hour long session of angry boxing that made use of the game’s High intensity difficulty and made myself suffer. Before I knew it, I was punching harder and faster, just like my dad had taught me. I didn’t actually need to punch like that for the game, but it actually made me feel good. It made me feel like my younger self and when I stopped, instead of collapsing and breathing hard, I had a few glasses of water and then cooked a barbecue since my brother was in the area. After lunch, I then proceeded to do another 14 minutes just to wind down my disappointment was gone, for logic had replaced it. Of course, there wouldn’t be any weight loss. It’s too soon for that and if anything, because of my focus on Cardio and Strength workouts, if anything, I should have put weight on due to muscle gain. I also still have another 7 weeks to see if it is possible for me to lose 6 kilos during a two month process, so just because things didn’t go my way today, it doesn’t mean I should just give up now. I am in this for the long haul and if today’s effort taught me anything, it’s that I still have plenty of fight left in me and just because last week’s approach didn’t work, it doesn’t mean I should write Fitness Boxing off just yet. There’s still plenty of punching left to do! Until next time, keep on gaming!